Layering flavor is a cooking term that covers combining, expanding, and intensifying flavors which is just one of many techniques Executive Chef Giovanni Arias uses to create the scrumptious, lower-calorie menu served at Miami’s Canyon Ranch Grill. I thoroughly enjoyed Chef G’s healthier renditions of everything from crab eggs Benedict with creole sauce, the totally addictive, crispy (from grilling not frying) yucca fries dipped in a lively habanero cilantro sauce, and a so-decadently-rich-I-still-can’t-believe-it’s-only-210-calories, Black Forest molten cake with brandied cherries, that I nicknamed him the ‘flavor whisperer’. Obviously I’m not the only one who feel this way since Chef Arias just received Cooking Light magazine’s Healthy Chef Award in their annual “Trailblazing Chef Awards” (2013). The 37-year old, Puerto-Rican born, Arias, draws upon his almost two decades of cooking at locally acclaimed restaurants combined with some exciting Latin-Floribbean menu twists to wow calorie conscious fans ranging from hard-core vegans to gourmands. Chef Arias: I grew up watching my father cook. He was way better in the kitchen than my mother. When I was 12 I was washing dishes at a bakery in Puerto Rico where I developed a passion for cooking that has only increased over the years. At 20, I attended Johnson & Wales in Miami and I’ve been cooking ever since. Were you always interested in healthy cooking? Chef Arias: Not really. Puerto Rican food can hardly be considered healthy. As a matter of fact, when I first started cooking at Canyon Ranch, I didn’t even know what tofu was. What is the most challenging part of cooking for Canyon Ranch? Chef Arias: At first it was learning how to cook without a deep-fat fryer in the kitchen. But I soon began to develop more tasting and flavor profiles. I learned how to maximize flavors by cooking with fresh, local ingredients and using cooking techniques such as reductions and caramelization. Chef Arias: I think I’d like to make floral arrangements or be a party planner or something like that. I love decorating tables. Pretend you forgot your wife’s birthday. What would you cook to get back in her good graces? Chef Arias: I’d start with crispy foie gras & lobster and a frisée salad topped with candied pancetta and a vanilla vinaigrette. The entrée would be braised osso buco with truffle, black trumpet mushroom risotto, and haricot vert with a citrus-parsley remoulade. For dessert, I’d make her apple-stuffed crepes with dulce de leche ice cream and a honey-pecan glaze. What is your favorite ingredient at the moment? Chef Arias: I love working with dried chilies from all over the world. They provide such intense flavors. Your menu is very international. Have you traveled much? Chef Arias: No. Sadly, I haven’t even been to Europe, and I’m dying to go to Japan because I really love their food. I mostly just read a lot about food and ingredients from other countries. I know Kale is really good for you but I don’t like the texture. Any tips? 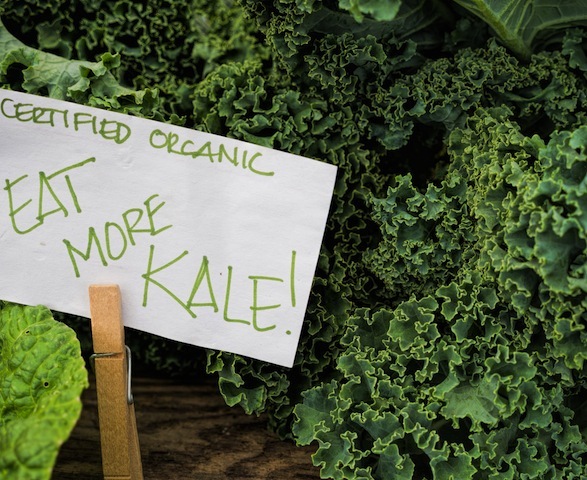 Chef Arias: An easy way to serve kale is to shred it very thin, add some salt and lemon juice and just massage it in for a minute. This will tenderize the kale and also eliminate the bitterness. One of my favorite dishes at The Ranch is the Zucchini Hash Browns. It came on the side of my grilled trout but I think it would be equally tasty with poached eggs for breakfast. Chef Arias has graciously allowed me to share the recipe with you. Medium grate zucchini and wrap in cheesecloth. Squeeze out all excess water from zucchini. In a large bowl, combine by hand the squeezed zucchini, crumbled feta, egg whites, garlic, oregano, salt, and pepper, breaking up feta cheese very well. Place mixture into a fine mesh strainer and press to release excess water. Allow the mixture to sit in fine mesh strainer over a bowl for about 10 minutes to ensure excess moisture is released. Place drained mixture into a large bowl. Add the panko breadcrumbs and allow the mixture to sit for 3 to 5 minutes to ensure all liquid is completely absorbed. Scoop a 1/3 cup mixture and hand form cakes into 2-inch diameter cakes. Lightly coat a large sauté pan with canola oil spray. Sear each cake for about 1 minute on each side. 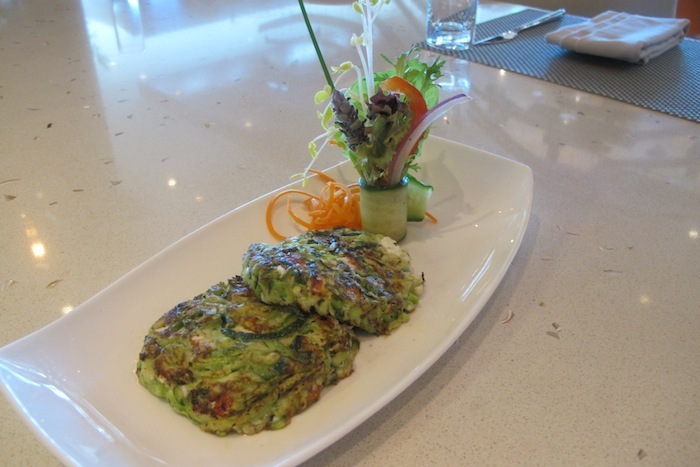 Serve 3 zucchini cakes topped with 3 tablespoons chopped pistachios and 3/4 cup Horiatiki Salad on the side. Makes 5 servings, each containing approximately: 330 calories, 29 gm. carbohydrate, 20 gm. fat, 23 mg. cholesterol, 14 gm. protein, 683 mg. sodium, 6 gm. Fiber. 1. In a large bowl, toss together cucumber, tomatoes, red peppers, olives, and onion. 2. In a separate small bowl, combine garlic, vinegar, olive oil and oregano. Add to vegetable mixture and toss to combine. For more information about Canyon Ranch Miami Beach please visit their website.